Reeni Inosha's market rate, faith and cultural values are important—but how far will she go to have it all? After sell-out shows and rave reviews at the 2018 Melb Comedy Festival for Improvised Real Housewives, Reeni returns solo! Get enlightened by the funniest Sri-Lankan Buddhist you'll ever meet. This is a show for you if you've ever wondered "how does Olivia Newton John relate to the Sri Lankan caste system?" 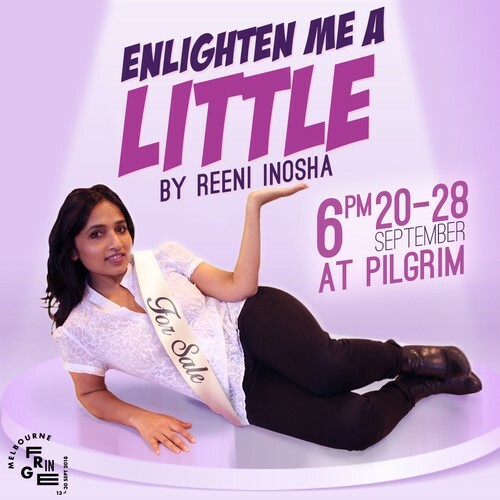 Through hilarious sketches and storytelling, Reeni takes you on an unbelievable sequence of true stories of living in multiple conflicting worlds. Guaranteed to make you laugh, learn and relate to this one-of-a-kind high energy show.